Who really feeds the world? There is a common conception that industrial agriculture feeds the world. While only 30% of the world’s food is actually produced on large-scale farms, industrial agriculture is a primary contributor to the ecological destruction of the planet. Additionally, according to the IUCN, 75% of the genetic diversity of agricultural crops has been lost. 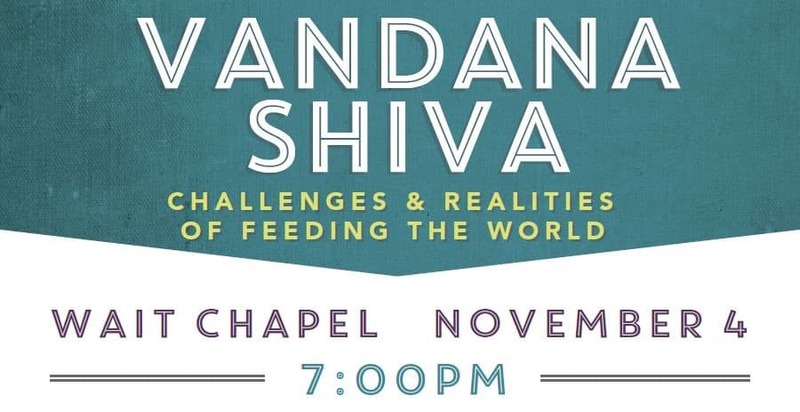 In this final keynote lecture of our series, Dr. Shiva will address the myths that allow an unsustainable, unjust, violent system of food production to dominate our discourse, while the initiatives and movements that are creating sustainability, justice, and peace are marginalized. The event is free and open to the public. Additional resources, including a reservation form for group seating, are available at https://sustainability.wfu.edu/make-every-bite-count/. A book signing will immediately follow the lecture. Copies of the brand new collection of essays Sacred Seed (edited by Global Peace Initiative of Women) will be available for purchase. Attendees are encouraged to bring their own copies of Shiva’s books for signing. This keynote lecture is co-sponsored by the Office of Sustainability; School of Divinity’s Food, Faith, and Religious Leadership Initiative; the Center for Energy, Environment, and Sustainability; Department of Biology; Department of Chemistry; Pro Humanitate Institute; and Women’s, Gender, and Sexuality Studies. Learn more about the keynote and reserve seats prior to the event.